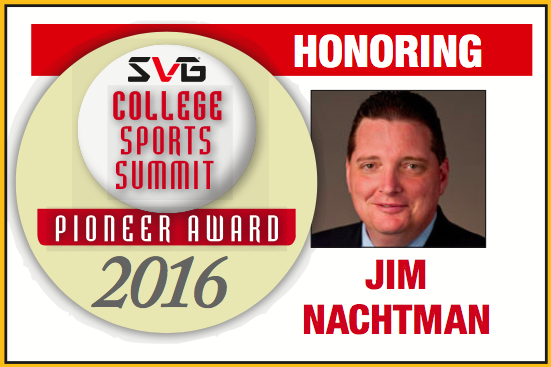 The Sports Video Group is pleased to announce that Jim Nachtman, assistant athletic director, media and video production, Penn State University, will be honored with the 2016 SVG College Sports Summit Pioneer Award. Nachtman will be celebrated at this year’s SVG College Sports Summit at the Omni Hotel at CNN Center in Atlanta on June 2. The SVG College Sports Summit Pioneer Award celebrates those who have innovated in the fields of video production and technology at the university level and have advanced the industry at large. A lifelong Nittany Lion, Nachtman graduated from Penn State in 1990 with a telecommunications degree and spent a decade (1989-1999) serving as technical director of Penn State Public Broadcasting before joining the Department of Athletics in 1999 as director of broadcast operations. In March 2015, he was elevated to his current position. Nachtman played a pivotal role in the conference-wide adoption of the Big Ten Network prior to its launch in August 2007. He also was instrumental in the technological infrastructure within the Pegula Ice Arena, the university’s state-of-the-art ice-hockey facility that opened its doors in October 2013. In addition, he helped oversee installation of a new 152- by 37-ft. videoboard at Beaver Stadium in 2014, which currently ranks as the seventh-largest videoboard in college football. Nachtman, who has been an active member of the Sports Video Group and the SVG College Advisory Committee since their inceptions, lives in State College, PA, with his wife, Tina, and children Sarah, Katie, and Robert. The SVG College Sports Summit Pioneer Award is selected by a panel of past Pioneer Award honorees, current and former SVG College Sports Summit chairmen, SVG staff, and senior members of the SVG College Advisory Committee.